Fire stolen from Heaven and given as a gift to confused humanity; the Light of rationality would blaze unquenchable, now, among the ephemeral lights of the mortal realm. Anger at the violation of the heavenly boundary was swift and the consequences merciless. 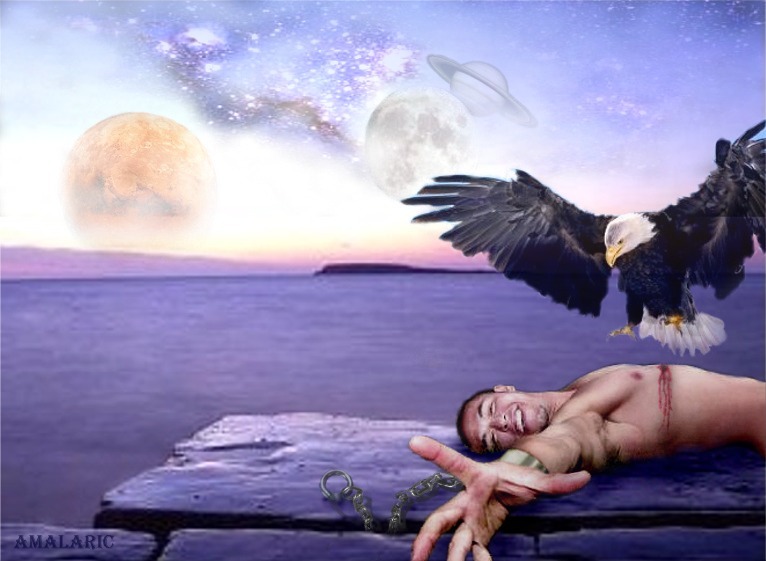 Prometheus, son of Titans, was bound to a rock and visited daily by an eagle sent to tear him open and feed on the flesh of the rebellious god. The gift came with a price; in my vision saturn conjuncts with a full moon in Scorpio as depthless desire meets stark limitation- and so Prometheus suffers and embodies in himself the paradox he created for humanity. Mars edges past the horizon and the human race learns that fire has more than one use.